Self-plagiarism, also known as “recycling fraud”, is a problem often found in academic circles. It arises when an author republishes an entire work, or reuses significant portions in a new work, without referencing the earlier work. It is more insidious because most people wouldn’t consider taking from oneself to be stealing. Nonetheless, self-plagiarism is an issue, particularly for publishers with interests in the original work. Additionally, to the extent it is passed off as new material, the self-plagiarism purports to be something it is not – virgin territory. Again, my emphasis. Self-plagiarism, however, does not benefit from such solid agreement in definition – misuse of another’s work. Self-plagiarism involves re-use of identical or nearly identical portions of an author’s own writings, without acknowledging that the author is copying from his or her prior work and without citing the prior work. Thus, it differs significantly from the definition of plagiarism tied to the concept of intellectual theft from another, making self-plagiarism susceptible to significant dispute. Unlike plagiarism, there is nothing illegal about self-plagiarism, although it could subject one to civil liability to a copyright holder. And it certainly smacks of unethical behavior. To the extent you are interested in learning more about self-plagiarism and its pitfalls, the fine folks at Paradigms LLC, the makers of iThenticate Software, have prepared a white paper explaining its intricacies. You can download the white paper here. Practicing attorneys are encouraged to “self plagiarize” in creating legal documents – why reinvent the wheel when you already filed a brief on the same legal points last month or draft a contract without reference to language you employed in the standard terms in your prior contracts? However, lawyers who moonlight as authors of legal treatises, periodicals, handbooks or other more commercially viable publications should at least confront the concept and understand the consequences. If you really find yourself troubled by the possibilities, you can always look into the iThenticate software product – it compares manuscripts against more than 14 billion web pages, more than 30 million published research articles from 150 leading science, technical and medical publishers, and over 80,000 major newspapers, magazines and scholarly journals. So, next time you want to use that gem you previously employed in a prior work, make sure you cite the source – you. Remember the four R’s: reduce; re-use; recycle; and, re-attribute. DISCLAIMER: I did not run this post through the AP Style Book’s Grammar Editor and my blog editor doesn’t have spell-check. I still read it a second time to make sure I crossed my t’s and dotted my i’s. I’m old-fashioned like that. My spouse, who often goes by the self-annointed nickname “Conan the Grammarian”, forwarded this little gem to me this morning – Good Grammar Is Old Fashioned, Unecessary and Bad For Your Career. Leaving aside omission of the serial comma, I have a few nits to pick with this statement. Penelope Trunk is the founder of three startups, most recently Brazen Careerist, a professional social network for young people. Previously she worked in marketing at Fortune 500 companies including Mattel and Hyundai. Her blog about career advice, blog.penelopetrunk.com, receives half a million visits a month and is syndicated in more than 200 newspapers. She frequently appears as a workplace commentator on CNN, 20/20 and FOX News. She’s also the author of Brazen Careerist: The New Rules for Success, a bestselling career advice book for Generation Y. The cost of perfect grammar — even spelling — is just too high. Learn to live with sloppiness. It just might help your career. Why do so many people care about grammar and spelling? Seriously. There is very little in this world that warrants text-based perfection. Are you writing the copy for a billboard in Times Square that is only three words? Don’t have a typo. Let’s see. The second sentence is incomplete. In fact, it is an adverb. An adverb that means in a serious manner, to an alarmingly grave extent, or with genuine, earnest intent. But what in a serious manner, to an alarmingly grave extent or with genuine earnest intent? Adverbs are modifiers and I cannot tell from this single adverb sentence exactly what seriously is modifying here. When someone asks me to take something seriously, then I really need to know to what I am supposed to accord the weight. Is it the question that precedes the statement? Is it the sentence that follows? I can’t tell, so I think I will skip right over the seriously. It is seriously lacking in the action and object vital to conveying the point. Not content to impress upon us that brevity is our friend with the single adverb sentence, Ms. Trunk then uses an even more nuclear tool, the single adverb paragraph. It is a complete sentence in that it is followed by a period and an ellipses. Lawyers are very familiar with the ellipses: we regularly quote from cases, statutes, and authorities, while attempting to fit within space constraints. In formal writing, ellipses are used to show places where words have been omitted from a quote. Where the omission is within a sentence, the reader will see three dots. Where the omission is at the end of a sentence, the reader will see a period in the normal place, followed by three dots. So, according to general understanding, “Otherwise….” is a complete sentence and, in this case, a complete paragraph. For the record, otherwise means under other circumstances, in another manner, in other respects. The implication is that, when you use “otherwise”, you will then find out what should happen in those other circumstances, manners, or respects. What is she trying to say here? I don’t know with certainty. There is too much ambiguity arising out of her use of these terms and placement of the paragraph breaks for me to fully fathom her message. Presumably, in her first “two” paragraphs, Ms. Trunk believes that grammer is important for the three-word billboard in Times Square, but nowhere else. Especially not in blog posts attempting to make a point about the futility of grammar. Is this true, lawyers? What about in drafting legislation? What about in writing a brief to be filed with a court? How about in a legally-binding agreement? I clicked on a few links in her post to glean a greater understanding of her message. I believe her underlying point is that writing with rhythm and cadence is far more important than writing with clarity. And, by clarity, I mean following certain basic rules regarding grammar and usage so that the import of the message is not lost in creative innovation. How about in venues that depend heavily on that clarity. She also seems to be saying that our limited energy should be spent writing, and not worrying about grammar. But that really does depend upon the audience and your purpose, doesn’t it? If you can attend to both your content and your structure, why wouldn’t you? Ms. Trunk also believes that the real reason that people note grammar is to help them separate the well-educated from the riff-raff. She seems to believe that grammar rules are a snob’s best friend. Where has Ms. Trunk been hanging out? Here is my take on grammar and usage. Examine your purpose and know your audience. Tailor your “perfectionism” to the setting. I concede that word choice and the grammar rules themselves are not black and white – take a look on the internet to see the disputes that abound concerning use of contractions and splitting infinitives. Nonetheless. whether Ms. Trunk likes it or not, bad grammar in almost any context muddies up the message and can even actively distract from it. There are many fora in which creative “rule-breaking” is permitted and even encouraged, but business writing is not one of them. In law, a mispelled word or misplaced punctuation mark can mean the difference between yes and no. At its very core, language is a communication tool. We speak and write to ensure our message is heard. The grammar rules are meant to give us a framework upon which to lay our word choices, to encourage a foundation enabling us to reduce the guesswork that would prevail if there were no rules. Do you remember that famous scene in the movie Airplane, when Barbara Billingsly steps forward to tell the flight attendent, I mean stewardess (see, I can accept change): “Oh Stewardess, I speak Jive”? Have you ever tried to “understand” the lyrics in a rap song? Don’t get me wrong here, people. I love rap music. But I believe that the deviations in the language used in rap music or within other groups often may be intentionally difficult to parse chiefly due to the singer’s or speaker’s desire to target his message to that particular audience, and not to the larger group. What if you need to reach the larger group? Does rap work in that context? While there are those few examples of judges taking liberties with the language in their decisions, I know that I would not risk a client’s cause with taking those same liberties in a brief or contract. I believe that, in order to use language to best effect, the writer should be mindful of both the rules of grammar and the meanings of words. 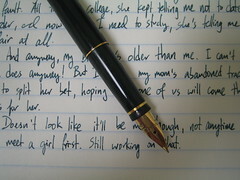 Without a working understanding of both, the writer may be incapable of communicating his message to his audience. The code is there to help reduce misunderstandings. You can certainly break those rules, but you risk losing the message in the murk. Your gamble, I suppose. I think it is easy for someone like Ms. Trunk to flaunt the rules of grammar with wild abandon: she is well-educated and knows the rules well enough to break them. But what about someone who is unwittingly or unknowingly breaking those rules? If language and grammar are not important, then why would Ms. Trunk suggest that it is a good idea to hire someone to help you write your resume? Persuasive writing. It’s what we do. Whether selling a product or service or an argument to the court or opposing counsel, writers need to choose their words carefully. To make a proper pitch, writers must address the rational and emotional needs of their intended audience. While working “revolutionary,” “miracle,” and “magic” into your next brief might be a bit of a stretch, consider the tone embodied in these lists – people respond more positively to a positive sentiment, and less positively to an ambivalent or negative sentiment. Rather than cut down the opposite viewpoint, consider emphasizing the positive, and you too might be able to sell like Don Draper. Yahoo! is here to help you write for the Web with its very own Style Guide (link). Yahoo! and the Guide promise to help you “write and edit for a global audiences through best practices from Yahoo!” Quite a promise. Yahoo! cautions that it is different writing for Web than for print (all references to proper grammar, spelling and traditional style aside), and that Yahoo!”s version will power your style up for the digital age. While the book itself costs (link here to pre-order from Amazon at discount from list price of $21.99), there are a few articles at the link at the top that can be had for free. The headings include “Write for the Web”, “Identify Your Audience”, “Define Your Voice”, “Construct Clear, Compelling Copy”, “Be Inclusive, Write for the World”, “Make Your Site Accessible to Everyone”, “Write Clear User-Interface Text” (which sounds like an oxymoron to me), and “Streamline Text for Mobile Devices.” There are best practices for editing online material, including punctuation, grammar, organization, and number styles. There is also a sample from the book’s “word list,” covering terms related to communications, technology, branding, and other topics that Yahoo!’s U.S. editors have encountered frequently. The site includes some outside resources (link here) on Basic Web Page coding, SEO, research tools, and a Web Editor’s tool box. Last but not least, you an even submit a question to a Yahoo! editor (link here). Simply sign on with your Yahoo! user id and submit. Nice resource for refining your Web content. I didn’t know there was such an affliction. Not only is such compositional agony out there, it is the subject of college coursework. Stephanie Allen at idealawg (link here) posts on the subject from her experience in a workshop course presented by Dr. Donna Strickland. I urge you to hit the link to her post; it is detailed and definitely worth a read. These “causes” actually look like symptoms of pain to me. Why do these behaviors arise in the first place? Dr. Strickland does set about crafting some cures for these conditions, which include letting go of the “mindfullness” that drives the above-cited “causes.” Dr. Strickland’s steps include incorporation of Boice’s steps and appear centered on the idea of dropping blocks that our intellect can put in place. Patience, yoga, beginning before “ready”, all have a place in aiding writing and curing pain. Attorneys faced with writing a brief or motion may find themselves in pain as well. But we don’t often have the luxury of losing the “mindfulness” aspect of our experience. Case in point, it makes little sense to start writing before you are prepared with the proper research, particularly if a deadline is looming. Writing twice and cutting once isn’t always an option. But, we can practice our writing whenever possible to work through some of the issues implicated in the writing pain process. One of the real benefits of blog writing for lawyers is that it gets them to engage in a different form of writing than is usually before them and may even help to loosen up tight writing muscles that even Ben-Gay can’t touch. In any event, Allen’s article includes links that may be of interest. If you have thoughts on the writing process and how to get past your own personal hurdles, I would love to hear about them in the comments. Hat tip to far too many people to list here.